The 2013 session of the 118th Indiana General Assembly adjourned sine die on Saturday, April 27, 2013. The legislature considered over 2,200 bills during the session, many of which addressed education policy and school governance, or were child-related legislation. The following is a summary of 12 key PK-12 education bills that were enacted into law by the legislature. Many other bills were passed by the legislature on a number of public policy topics including PK-12 education, higher education, and child welfare and advocacy. For more information on these laws, go to: www.in.gov/legislative. The acts of legislation included in this report were selected by the Center for Evaluation & Education Policy (CEEP) at Indiana University for their significance and potential long-term impact on the PK-12 education delivery system in Indiana. 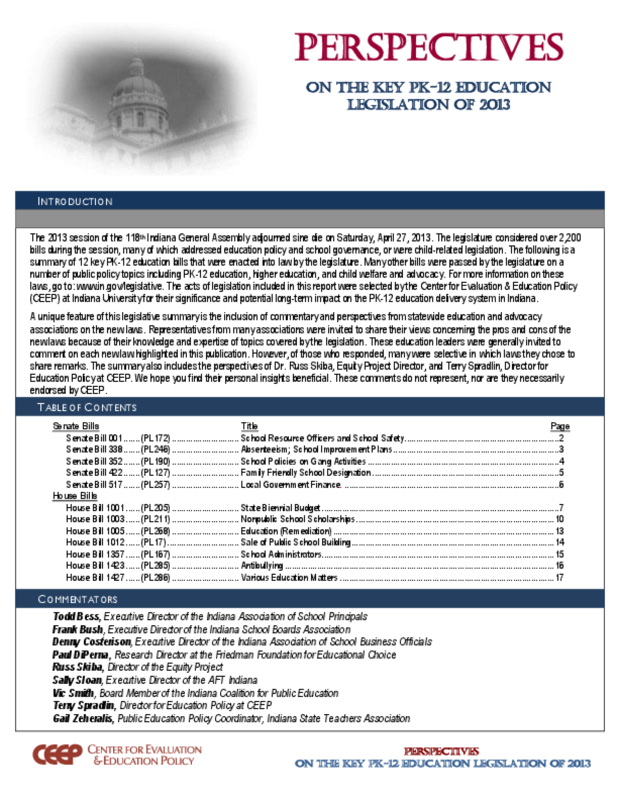 A unique feature of this legislative summary is the inclusion of commentary and perspectives from statewide education and advocacy associations on the new laws. Representatives from many associations were invited to share their views concerning the pros and cons of the new laws because of their knowledge and expertise of topics covered by the legislation. These education leaders were generally invited to comment on each new law highlighted in this publication. However, of those who responded, many were selective in which laws they chose to share remarks. The summary also includes the perspectives of Dr. Russ Skiba, Equity Project Director, and Terry Spradlin, Director for Education Policy at CEEP. These comments do not represent, nor are they necessarily endorsed by CEEP. Copyright 2013 Center for Evaluation & Education Policy.